Touching upon the Kashmir issue for the second time since his victory in the Pakistan elections, Imran Khan said for both nations to move forward, the Kashmir conflict should be resolved. Islamabad: Pakistan Prime Minister Imran Khan on Tuesday came to the defence of Punjab minister Navjot Singh Sidhu after he faced severe backlash and criticism back home for hugging Pakistan’s Army General Qamar Javed Bajwa and sharing the stage with the president of Pakistan-Occupied Kashmir (POK) during his swearing-in ceremony. In his victory speech on July 26, the World Cup-winning captain had said his government would like leaders of the two sides to resolve all disputes, including the “core issue” of Kashmir, through talks. “If India takes one step, Pakistan will take two,” he had said.ubcontinent. Thanking Sidhu for attending his oath-taking ceremony, Khan said those targeting th he newly elected Pakistan PM said Sidhu was an ambassador of peace and without harmony both the nations won’t progress. “Sidhu was an ambassador of peace and was given amazing love and affection by people of Pakistan. Those in India who targeted him are doing a great disservice to peace in the subcontinent – without peace, our people can’t progress,” Khan tweeted. 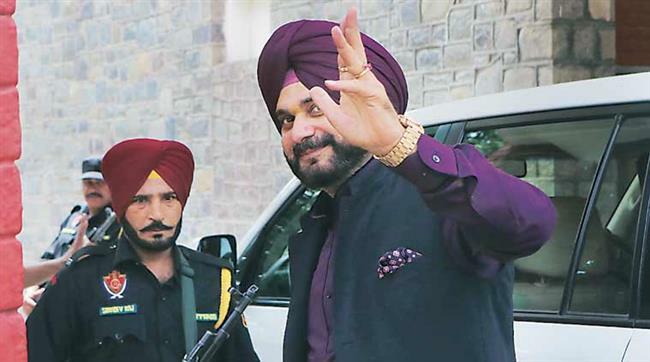 Following the oath-taking ceremony on Saturday, Sidhu came under fierce attack from non-Congress parties in Punjab and was even ticked off by Chief Minister Amarinder Singh himself. Reacting to the criticisms, Sidhu said his visit to the neighbouring country should not be seen through a political lens and he went there on the invitation of his friend Imran Khan.e politician were doing a disservice to peace in the s ouching upon the Kashmir issue for the second time since his victory in the Pakistan elections, Khan said for both nations should move forward and the Kashmir conflict should be resolved. “To move forward Pakistan and India must dialogue and resolve their conflicts incl Kashmir: The best way to alleviate poverty and uplift the people of the subcontinent is to resolve our differences through dialogue and start trading,” he said.